Ben Davies of Hinde Capital released a report this week titled, "Silver Velocity - The Coming Bullet." It is a fantastic piece that gives a clear overview of the market today as well as where we go from here. In the report he describes the event that took place in July 2008, which I like to call the Midnight Massacre. The following graph shows the massacre beautifully. 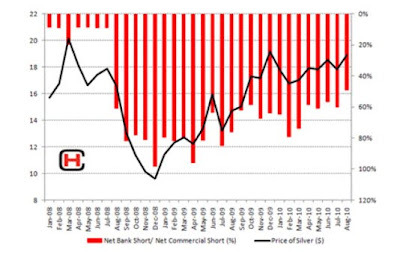 The red lines show the % short position and the black line shows the price of silver. You can see when the red lines exploded downward on July 2008, and peaked during December 2008 at 99% of short position. As you can see the commercial banks have held their short positions extremely high since the night of the massacre. You can also see the price of silver has risen steadily (black line) in the face of this extreme paper market manipulation. The reason for this is because astute investors that understand that the paper price is being artificially held down at the COMEX have been purchasing physical metal at the artificially low prices. In addition to this "problem" the COMEX now holds less physical silver than has been lent short in the market. They work on a "fractional" reserve basis that most experts agree is around 12:1. There will be a scramble for physical metal at a time when there is none available. Can the banks bring the price lower in the short term by increasing their artificial short position? Of course they can, but this just provides a better opportunity to buy more. The best play is to accumulate physical metal every month and continue to hope that they hold the prices down. Focus on the number of ounces you own, not the paper price for those ounces.